A mature, female spider needs to know how to make proper webs. But spider A was still struggling. First, she was reluctant to make webs. Second, whenever she made webs with encouragement and pressure from the colony, it failed its purpose. Spider A’s web had never been able to catch a single prey. Once a moth had flown in to her web; but instead of entrapping it, the moth managed to fly away with the web. Remembering the incident, Spider A still felt a ridiculous lightness of spirit amounting to an upstart dizziness. The moth was motley of colours with transparent wings. Spider A’s web was in the corner of a wall and in the morning when the sunlight fell on it, it created a kaleidoscopic effect. So, when the moth flew in to the web, it was a burst of colours splashing the monochromatic, lacklustre walls of the humans with splendid, celestial brightness. Spider A saw the moth escaping with the web, and although she was hungry, she felt intensely happy. She had given her precious moth a rainbow tail. Spider A’s mother had eaten her father. Therefore, in the family, there was no contradiction between loving and eating someone. Spider A could have eaten the moth without compunctions. But she wanted it to live. Perhaps, there is too much sentimentalism that must be overcome to become a true spider. She needed to urgently forego her gentleness. Spider A was not very proud of her gentleness—she craved for the tumultuous cruelty that ruled the Spider Empire of which her mother had been the matriarch. Her mother, Spider Q, was brave and very powerful, so much so that Spider A had always felt a hopeless attraction towards her. And surprisingly, despite being a weakling of a child, Spider Q had been very protective and indulgent towards Spider A. She talked of the need to maintain the rules of the colony. When Spider A asked her where did the rules come from and where would one go if one did not follow them, Spider Q would not be angry. She would look at her ward with suspicious eyes but answer kindly “We are not intelligent creatures. We follow our natural instincts. The rules are basically our instincts.” Although Spider Q exhibited infinite patience in dealing with her, Spider A was simultaneously afraid of the violent mood swings of her mother, which had once resulted in to the ruthless killing of one of her sisters. Therefore, she would ask hesitantly “Is it not possible that the rules shape our instincts instead of instincts forming our rules?” Spider Q would sigh and say “You are like your father.” Remembering what happened to the father, Spider A would abandon the conversation. She was told by the members of her colony that her mother mated beneath her status. Spider A’s close friend Spider F offered an explanation for it. “It was a tactical move.” Spider A would look at Spider F with her eight wide eyes; and Spider F would continue his cynical wise crack “The ritual of eating your mate is becoming increasingly out dated, but it still offers the female the aura of a femme fatale. Your mother wanted such an image. It would help her become the matriarch of the colony. So, she mated with a worthless spider whom she could easily sacrifice to the cause.” Spider A did not believe him. She knew her mother was tough, cruel, impetuous and unpredictable, but she was not cold and calculative. “Your father did not offer any resistance. He could never match the physical prowess of your mother. But although he knew what was coming, he did not escape.” These talks about her father would make Spider A angry, but she realized it was an impotent rage. Although in reminiscing moods her mother sometimes made passing references to her father, she knew she was not allowed to ask anything about her father, let alone demand an explanation for killing and eating him. With the mating season approaching, Spider F was the natural choice for Spider A’s mating spree— they were friendly; and being unaware of his venomous nature, Spider F was one of the few male spiders whom Spider Q approved for her favourite daughter. However, although Spider F was a dear friend, Spider A was repulsed by the idea of mating with him. In fact, she abhorred the concept of mating. What was the point of producing numerous children, not all of whom you would know, recognize and distinguish; and some of whom you would kill and eat? And those who would not die prematurely would, like her, pass their lives without knowing the reasons for living and dying. Spider A did not believe in survival of the fittest. The life unaware, which she was leading, was equivalent to death. In her condition of life-in-death, the distinctions blurred and the anxieties of death became irrelevant. Perhaps, her father had also felt the same; and did not escape his impending death. There was another similarity between the father and the daughter—their inability to make webs for catching preys. 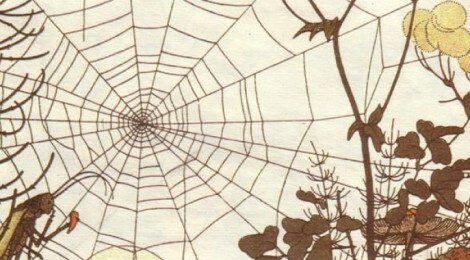 The garrulous Spider F had rubbed his feet and told her “Your father made decent webs. Many said they were beautiful—they were like pearls and diamonds smashed and stretched to form intricate patterns. And they could tell time for us.” “How can webs tell time?” Spider A asked incredulously. “The soft hues of the morning sun, the raging blaze in the afternoon, the tentative glow of the falling dusk and even the thick darkness formed separate patterns in his webs. His webs pre-empted the changing times in the day.” However, with all their artistic grandeurs, the webs could not catch preys. And, although the spiders of the colony, including her mother, were greatly impressed by his webs, they pretended that they were worthless and rubbish. Few days before his death, all his webs were swept away by the humans. It was cataclysmic for the colony, but they pretended nothing important had taken place. According to Spider F, Spider Q seized this opportunity to find her sacrificial partner because the demoralized, talented spider was perhaps already harbouring the thoughts of death. On the same day the moth flew away with her web, Spider A felt the need to protest against the killing of her father. She marched and looked straight at her mother’s several eyes and demanded “Why did you do it?” It seemed Spider Q had anticipated this question for long. She smirked; and then she almost flew at her daughter. The loyal army of female spiders who waited in line for her command were ready to devour Spider A. Their predator’s instincts had been aroused. Her mother stopped. But the army of spiders, intoxicated by the prospect of a gory kill, continued marching towards her. Although Spider A did not remember pushing her mother, the rest of the colony later declared that Spider A had masterfully hauled Spider Q in front of the maddened army; and the lustful avalanche tore her in to pieces. Sacrifice ran in the family. The father whose web could anticipate time was perhaps gifted with the ability to foretell his own death; but he wanted her to be born. And the mother familiar with her mercenaries could very well predict the result of baiting their hunger; but she wanted her to live to perhaps become the leader of the colony. Heralded for her bravery and astuteness in vanquishing her foe, Spider A was declared the prospective leader of the colony, provided she overcame her shortcomings, that is, she could make webs that would catch preys. The cowardly and meek Spider A could not say anything to clarify the situation, not even when she saw Spider F turning pale, anticipating in the process of their prospective mating a fate similar to his father-in-law. Spider A’s precious motley moth generally passed on from one wall to another in the mornings, anxious to get away from the trappings of the indoor to her vast playfield outside. Spider A’s abdomen had worked overtime in producing a web that would mesmerize the colony; surpass her father’s artistry; exceed the fatal strength of her mother’s web…and to satisfy the expectations of her kind, also entrap her precious motley moth to a liquefied death. As the moth unaware of its destiny fluttered around the web, Spider A waited at a distance with bated breath. The sunlight bounced rhythmically from the moth’s transparent wings on to the prism of her web; and entangled and ensconced in the web were the thoughts of love and passion; power and hunger; and a timeless embrace of preserve and perish. Madhumita Roy is pursuing PhD in English at IIT Kharagpur, India. Her works have previously appeared in Word Riot, Out of Print, Indian Review, Brilliant Flash Fiction, and others.